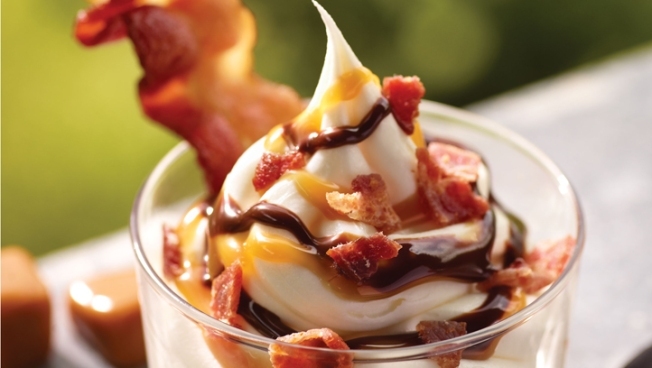 Burger King is introducing a bacon sundae as part of its new menu items for the summer on Thursday, June 14, 2012. For more than two decades, Burger King's mantra has been "have it your way," but even the biggest bacon enthusiast wouldn't have pictured BK's new bacon sundae as a part of the burger chain's new summer menu. Vanilla ice cream with fudge, caramel, bacon bits and a strip of bacon, Burger King's new sundae started in Nashville earlier this year and is the company's latest attempt to counter Taco Bell's mega-selling offerings such as a Doritos-flavored taco shell and a burrito stuffed with Fritos corn chips. The sundae is 510 calories and has 18 grams of fat and 61 grams of sugar, comparable to four liters of Mountain Dew. Other items on BK's summer menu include: Memphis Pulled Pork BBQ Sandwich, Carolina BBQ Whopper or Chicken Sandwich, Texas BBQ Whopper or Chicken Sandwich, sweet potato fries and frozen lemonade. They will be available until Sept. 3.